Everyone is familiar with the dry cell battery which discharges electricity from a chemical reaction, but some are not aware that this is simply a corrosion cell. It is accepted that if a battery is not connected in a circuit, then it will remain intact for several years but if it is used, it will quickly reach a stage when the metal will corrode to destruction. The electrolyte will escape from the battery and the torch, toy, radio (or whatever) will be spoilt. The metal in the battery has corroded to destruction in the same way that a pipeline will, if left unprotected. Sir Humphrey Davey, the inventor of the miners safety helmet light (the Davey Lamp) was the first to use cathodic protection to protect the copper cladding of wooden ships. He attached 'pig iron' anodes to the copper and this altered the electrical balance so that the iron was 'sacrificed' for the protection of the copper. 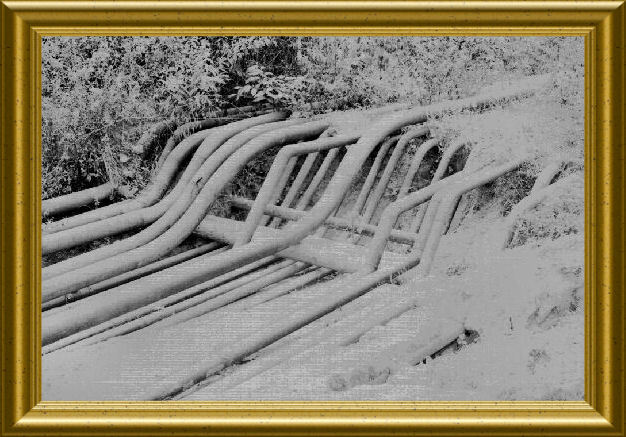 This is known as 'sacrificial anode cathodic protection' and it is the discharge of electrical current from the iron which maintains the 'dynamic equilibrium' which prevents the copper from corroding.He had made a gigantic battery in which the pig iron was corroding and giving off electrical current. This current was going into the sea and from there into the copper. The copper was thus made into a cathode in relation to the pig iron which was the anode. The cathode is protected from corrosion and hence the name 'cathodic protection'. 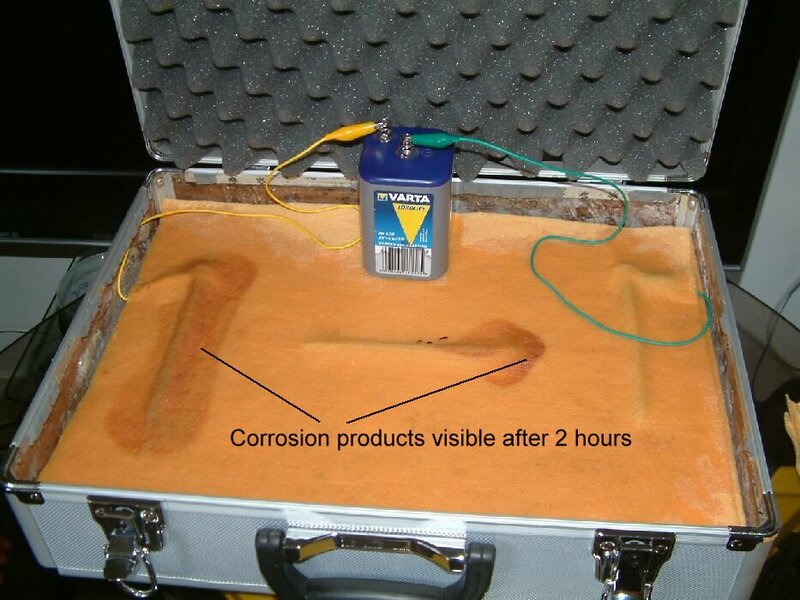 This picture is from the CPN corrosion course and shows corrosion being controlled using cathodic protection. It can be seen that corrosion products are staining the cloth where the currentis passing from the battery into the electrolyte and that there is no staining where it is entering the metal. 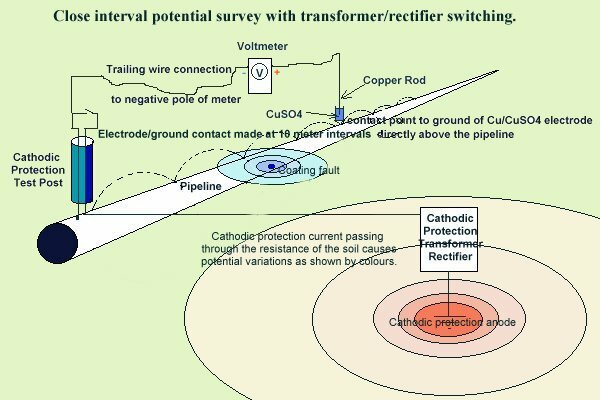 This demonstration is used to clarify the students understanding of the correct techniques in making measurements to establish a criterion that can be used to make sure that corrosion has indeed been stopped by any cathodic protection system at any location on the pipeline. The present codes of practice do not even claim to be capable of establishing this essential fact. CIPS (Close interval Potential Surveys) .